With a history of over 700 years, Yuandadu Chengyuan (city wall) was originally built in 1267 and finished in 1276. The north part was left out of the city when the north wall was moved southwards in the early years of Ming Dynasty (1368-1644). So far, we can still see the approximately 10-meter-high historic wall which is now called "Tucheng." The park was mandated as one of the main protected units of historic relics at city level by Beijing municipal government. For the sake of safety, Chaoyang District set up the Tucheng afforest team on September 25, 1974. 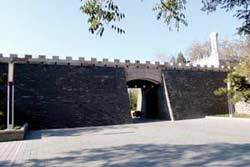 The city government made it a park on March 10, 1988, which is named "Yuan Dynasty Capital City Wall Site Park." 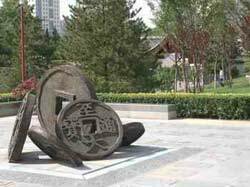 The part of the park in Chaoyang District is located on both sides of Zhongzhou Road. With the Huizhongancun of Taiyanggong Township at the east and Deqing Road at the west, the park stretches south to Tucheng Nanlu and north to Tucheng Beilu. It ranges 4.8 kilometers from east to west and measures 103-160 meters from north to south. Occupying 67 hectares, the park is naturally divided into 7 blocks with 9 scenic areas. These include three classⅠscenic areas -- Yuancheng Xinxiang, Dadu Dingsheng and Longze Yuyue, and six classⅡones --Shuangduxunxin, Sihaibinpeng, Haitanghuaxi, Andingshenghui, Shuijiehuadeng and Jiaolouguyun. Xiaoyue River is the main water scene site of the Yuan Dynasty Capital City Wall Site Park. The park ranges from the river to the south and north respectively. 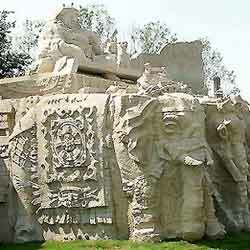 To protect Yuan Dynasty Capital City Wall Site Park, Chaoyang Afforest Bureau rebuilt the park in 2003.